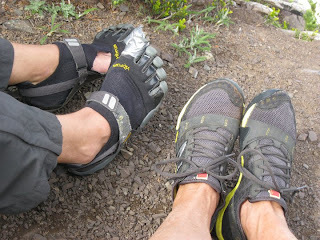 I would do a series of day hikes and backpacking trips, during a spring warm weather period. My destination for all these trips is Klahhane Ridge. This same area had recently been in the news headlines, because of a fatal mountain goat incident. That fatality would not hinder the raw beauty of this area. This hike is one of a kind and gives you postcard quality views of the Olympic Mountains, well as Port Angeles and Sequim surrounding areas. The first trip up was a day adventure with one of my friends. 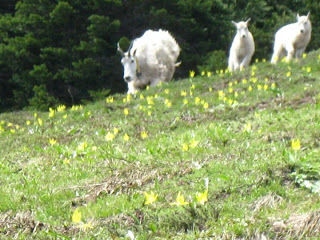 On the hike up, we saw several goats and dozens of wildflowers. It was a lovely trip. 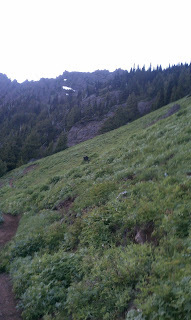 Again, one of the highlights of the trip was having a family of mountain goats come down the trail. 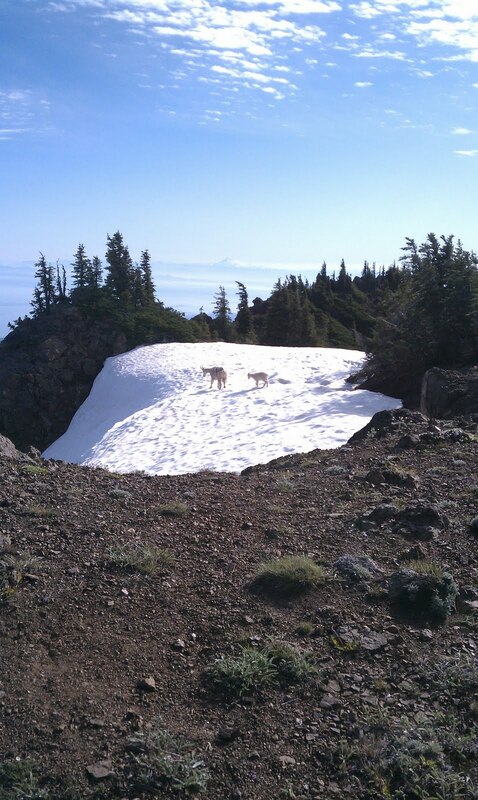 Watching the two baby's goats play and slide in the steep snowfield was a real treat. Wish I could have captured video, but the were moving to fast and I didnt have my camera ready. That footage would have been priceless. Oh well, its burnt into my memories for sure. 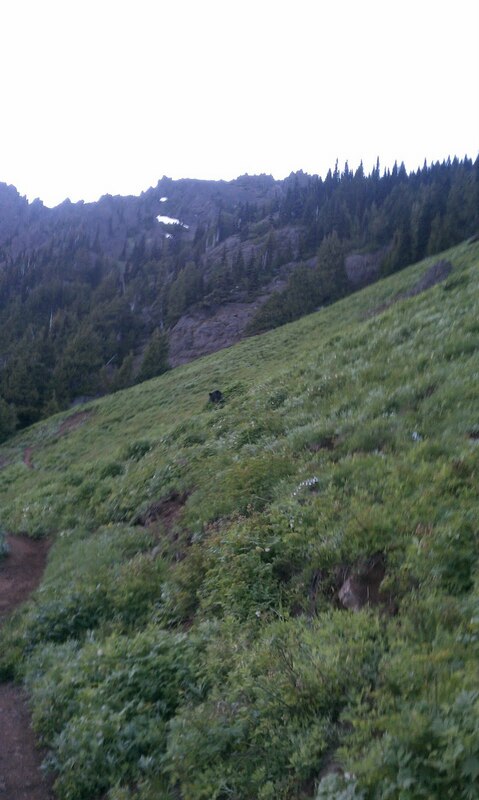 The next day I headed back up the trail after work, this time solo and doing it as a backpacking trip. I would stay overnight and try to get a few pictures of the mountain goats. This is one of my favorite places to watch sunrise in the whole Park. Made camp a little before sunset, in a prime spot I have used before on previous trips. After dinner, I had some time to relax and shoot some time lapse photography. At sunset I observed a set of climbers summiting Mount Angeles from a distance. After sunset the clouds below camp drifted around like milk inside a cereal bowl. A dew fell overnight in camp, because of that I was not able to sleep out the way I wanted, instead used a biy sack over my sleeping bag; to protect it against the open air. Half way though the night during a bathroom break, I looked up and watches several shooting stars, falling from the sky. It was amazing! The next morning I ate breakfast and slowly broke camp. Once I started hiking, I quickly discovered the snow was still super frozen from the night before; which made dangerous snow travel without traction aid. Seen a few mountain goats again on the way down, before dropping over the Pass and down to the trailhead. Once arriving, it was a quick trip back down to Port Angeles. My third trip out during that 7 day period. The weather window was too nice not to go up a third time. I wanted to get some more pictures and try to catch another awesome meteor shower. I was joined by another friend for another overnight trip. The conditions where a lot warmer this trip. We got to see a full variety of animals before the sun went down, including black bear, mountain goats, marmots, deer and birds. Mountain goats even walked right though our camp the following morning. Overall it was a great weekend, felt good to sleep in the open air, watch the stars and be with the animals. Most of all it was the experiences that i got to share with others that last a lifetime. I will continue to go back to this place, throughout my lifetime.